I decided to make macaroons and sponge cake, both very common in the 18th century. The macaroons tasted good but were a little flat, so I’m not sharing that recipe quite yet. 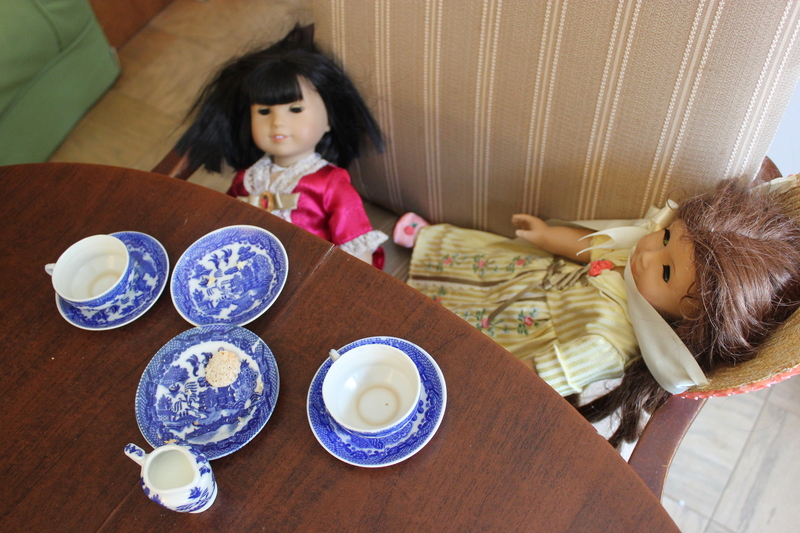 But they were easy to cut into doll-size rounds, and Felicity and Ivy loved them — in fact, they got a little grabby. On to the sponge cake, which is made with eggs, sugar, and flour but no butter or other shortening. The earliest known English sponge cake recipe appeared in 1615. In some older recipes, the spelling is spunge, not sponge, and as usual I prefer the weird old spelling. Sponge cakes were sometimes called Savoy biscuits (a.k.a. lady fingers), or Savoy cake, from the French gâteau de Savoie and Italian gâteau de Savoja. And the reason I’m getting all pedantic here is that there’s an interesting story behind the gâteau: Legend has it that a 15th-century Italian count from the House of Savoy gave this cake to Charles of Luxembourg, the future Holy Roman Emperor, who liked it so much he made the count a duke and imperial officer, setting in motion the House of Savoy’s rise to power — and eventual rule of Italy! One dozen eggs, whites and yolks beaten separately; one pint of sugar; one pint of flour; juice and grated rind of one lemon; mix yolks, sugar, flour, and lemon. Add Whites. This is a good cake. Elsewhere I’ve read that Jefferson brought his recipe for sponge cake back from Europe, which makes more sense since he went to France after Martha died. In any case, the above recipe is a bit lacking in detail, so I consulted Mary Randolph’s recipe for “Savoy or Spunge Cake” in The Virginia Housewife, Or Methodical Cook (1860). Hers has a different method — the whites are mixed with the yolks before sugar and flour are added. Damon Lee Fowler, editor of the wonderful book Dining at Monticello, writes that “period methods for sponge cake vary wildly.” I decided to try his version, which follows Jefferson’s method but Randolph’s proportions. Randolph also suggested baking the cakes in either little tin moulds or “paper cases” — 19th-century cupcake liners! I don’t think these were around in Jefferson’s time, and was surprised that they were in Randolph’s. I used liners as well because I have a ton of them, and that’s my feeble excuse for straying from authenticity. 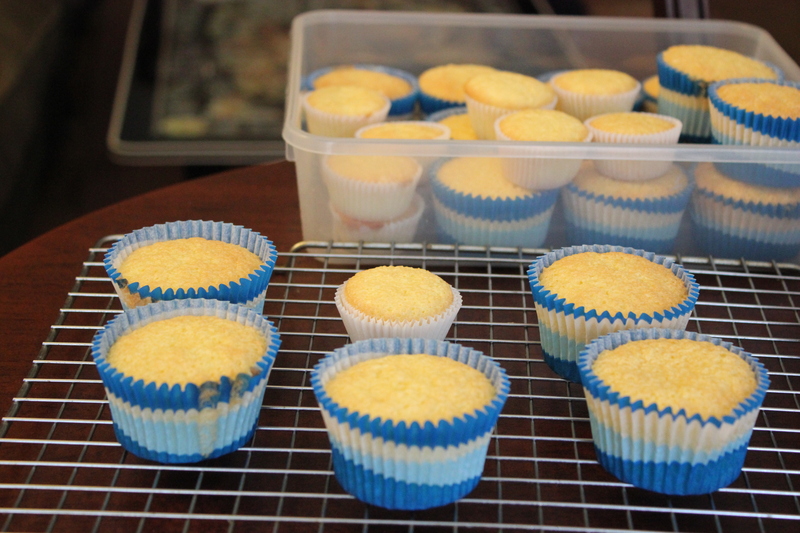 These cakes came out really nicely — very soft, very spongy, but in a good way. I made some in regular-size muffin pans, some in mini-muffin pans (for the dolls), and the recipe yielded about 16 regular muffins and 16 mini muffins. 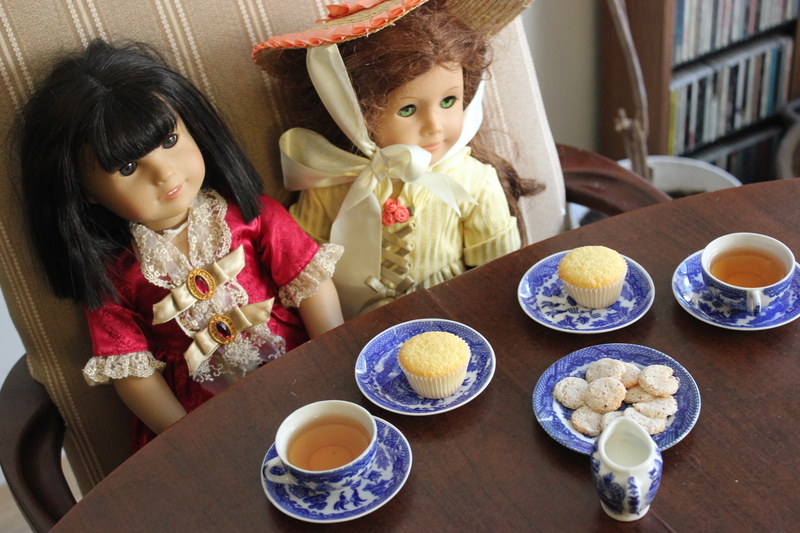 Jefferson supposedly liked to have these cakes with wine, but our dolls stuck with tea. Between the macaroons and the sponge cake, however, they clearly overindulged. 1. Preheat oven to 350°F. Put cupcake liners in 24 standard muffin cups (or twice that for mini muffins), or butter the cups and dust with sugar. 2. Separate the egg yolks and whites into two bowls. Using an electric mixer or whisk, beat the egg yolks until smooth and light. (I recommend the mixer, as I used a whisk and thought my arm was going to fall off — this batter becomes very stiff.) Beat in the sugar very gradually, and mix until the batter falls in thick ribbons. Beat in the zest. Gradually add the flour, mixing well. 3. In a separate bowl, whip the egg whites until they form stiff, glossy peaks. Fold one-quarter of the egg whites into the batter, then gently fold in the rest of the egg whites, one third at a time. Spoon the batter into the pans, filling the cups about two-thirds full. Bake until golden brown, about 15 minutes — 8-10 minutes should be long enough for mini-muffin pans (watch them carefully). 4. Cool pans on wire racks. If not using paper liners, run a knife around the edges of the cakes, then invert the pans to remove the cakes. Cool completely on wire racks. Serve dusted with superfine sugar if desired, although I think these cakes are sweet enough as is. They go nicely with preserves. I found the sponge cakes got very spongy after a day or so and stuck to each other, so don’t layer them when storing. But they’ll still taste good. This entry was posted in cake, desserts, muffins and tagged American Girl, baking, Cake, food, history, macaroon, Monticello, sponge cake, Thomas Jefferson by revolutionarypie. Bookmark the permalink. Many LOL’s whilst reading this one… thank you! So glad you liked it! Katie posed the sugar-coma shot, BTW, and took the last photo. Not bad for an eight year old. Great to see you back again. i love the blue willow china. So love the sugar coma. I felt similarly to Katie about dolls in my childhood, while in my adulthood I now just find them creepy. And this week being Passover, the macaroons and sponge cake are wildly appropriate to my kitchen: substitute matzo cake meal, and I’m on it. Also, I finished the Jefferson bio by Jon Meacham and am very pleased to be indulging in Jeffersonian desserts. Dolls are pretty creepy! I want to read that Meacham book. Speaking of which, why can’t modern-day presidents come up with recipes once in a while, like our Founding Fathers? I know Obama’s kind of busy, but still! This was a fun read. As I was reading of your tea parties and homemade macaroons, Ken and Isabelle came in the front door with take-out cheeseburgers and fries from Five Guys for dinner. –The suburban Slacker Mom. Thanks, Anke. We had fun doing it! I think you’re right — and that sounds delicious!